First Aid is a legal requirement for most businesses and, whilst there are any number of training providers, finding a company that understands your business is not that easy. At ABC-Response Training we recognise that each working environment is different, so we adapt our First Aid course specifically for your business, placing a core syllabus into context with the injuries that you are most likely to encounter. We also recognise that it can be very ineffective to mix say office workers with forestry workers on a general first aid course, so at ABC Response Training we don't do it. Each working environment is different, so we try to make every one of our courses industry specific. 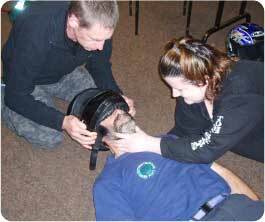 Our aim is to make first aid courses as practical and relevant as possible so if our delegates are for example people who are used to working outdoors then we teach the course outdoors as far as we practically can. We place a large emphasis on practical skills, believing that people will always remember information more effectively if they get to practice what they've been told, rather than have to sit in a training room and listen for hours on end. And if you get to practice in an environment that you're familiar with then so much the better. 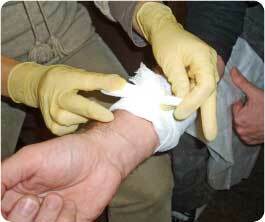 We also make use of wound simulation to make bleeding and wound teaching as realistic as possible. There is plenty of fake blood around on our courses so they're not for the faint hearted, but in an emergency would you want to be treated by someone who'd never seen blood?